청자상감'장진주'시명 매죽양류문매병은 청자 매병 가운데 시문(詩文) 장식이 상감되어 있는 희귀한 작품이다. 버드나무와 대나무와 매화를 두 군데에 각각 새긴 후, 그 사이 네 군데에 위패 형태의 창을 마련하였다. 그리고 그 안에 활달하고 기운 찬 필치로 시문을 새겨 넣고, 한쪽 버드나무 가지 사이 빈 공간에 ‘장진주(將進酒)’라는 시의 제목을 흑상감하였다. 시는 제목의 좌측 위패장식에 첫 부분을 배치한 후 왼쪽으로 돌아가며 내용이 이어진다. 이며, 중국 당대(唐代)의 시귀(詩鬼)로 불리우는 이하(李賀, 790∼816)의 작품이다. 유약은 은은한 광택이 있으며 부분적으로 산화된 부분은 녹색을 띠고 전면에 망상의 균열이 있다. 굽은 편평한 바닥의 안쪽을 둥글게 깎아 만들었으며, 바닥에는 모래를 받쳐 번조한 흔적이 남아 있다. 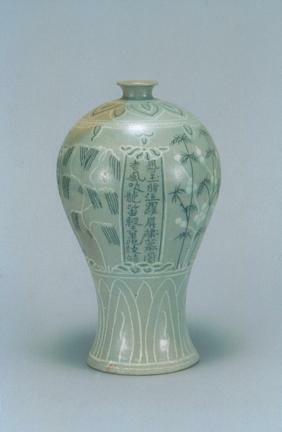 This vase is one of the very rare celadon prunus vases inlaid with poetic verses. Between inlaid designs of willow and bamboo trees and plum blossoms, there are four vertically-long rectangular frames. Inside the four frames, poetic verses in fluid and powerful brushstrokes are engraved. The title of the poem ‘Jangjinju (Let Us Drink a Toast)’ inlaid with black slip is visible between willow branches on one side. The poem begins in the rectangular frame located left from the title and continues in frames located further left successively. The following verses are engraved and inlaid inside each of the four framed rectangles: [Amber wine in a shade of a pumpkin, in a clear glass, wine drops red like pearls in a small jug/Dragons boiling and phoenixes roasting, crying jade-like tear drops of oil/Fragrant breeze wraps us gently in our embroidered tent with silk folding screens/To the music of the dragon flute and crocodile leather drum/White-toothed beauties sing and slim-waisted beauties dance around/The dusk of our youth before we realize/The dazzling fall of peach blossoms, as though a red rain shower/Let us drink all day, to our heart’s content/No wine ever accompanies the ghost to his grave] The poem is by Li He (790-816), a Tang-dynasty poet hailed in his time as a poetic genius. The glaze has a subtle luster and is oxidized in some places where it is green in color. Crackles are present throughout the glazed surface, forming a web-like pattern. The foot was carved out from the inside in a manner to create a concave recess. The underside shows traces of the bed of sand over which the vase was rested for firing.